Welcome to a family web site. I have documented some of our family history over an extensive period and I have included a genealogical database at this site. I have attempted to further understanding of some of our older ancestors by sketching historical snapshots of their times. No doubt somehow everyone is related to everyone else and these data merely show a series of such relationships. Increasingly, historical pedigrees become a list of elites and our database is no exception. Our family is not unique in any way and I suppose that we are merely proving that everyone is related to everyone else ...somehow. This documentation has become my own hobby. Do note that the data is incomplete, since it is based on my own research of available materials. Modern technologies and automation have greatly improved the quality and quantity of academic research made available to the public. I update continually the historical and genealogical areas in a quite hap-hazard manner. I have created this collection of data in part to balance the pervasive American view of British North American history. The popular American television views of history are not entirely inaccurate, but they are quite reasonably focused on American interests and motivations. Since we Canadians live so close to our American cousins, we get deluged with an American, rather than Canadian, view of history. I have underlined book titles in conventional academic style, despite perhaps causing some confusion as the same style is used for web site addresses. The reader must take the context into account. My extended family is now largely Canadian and I grew up thinking that Davy Crockett was some Western-Canadian pioneer who just traveled south for the winters. Canadian and American history are not the same. Cowboys are not a Canadian institution; and we could hardly owe a greater debt to the French voyageurs and coureurs de bois, who opened and defended much of our Country. Yet there are other anomalies, More historically, I was taught English history and thought Errol Flynn was quite right to think of the French, Irish, and Spanish as 'the enemy' - when he played his various movie roles. I may have found as many French, German, Irish, and Spanish ancestors as English and some re-balancing seemed in order for my own children. 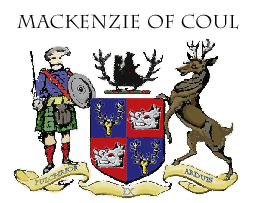 I am not a trained historian, and please note that this is only one family's history, this is definitely NOT an official Mackenzie Clan history. My mother's family includes many colonial American and Canadian historical figures and both my parents' pedigrees descend from illustrious Europeans. I have also included my cousins', my wife's, and our various in-laws' pedigrees limited by my available information. I have sketched historical snapshots, or essays, to illustrate various periods or events and given the scope I have been forced to use draft notes in order to size and plan my inputs. As I have time I am editing the various topics. Happily our North American roots are well balanced and my Moore, Armstrong, Willison, Hotz and Harding cousins attest to our international family reality. We are spread across several continents. Although I have made every effort to ensure the accuracy and reliability of the information here, all data are subject to human error, and serious researchers should always check the primary sources. Our family is mainly European: but most definitely not all.